I’m excited for you to start enjoying some of these beautiful oils. I’ve made it super easy! Follow these simple instructions. Please email me doterra@theorganisedhousewife.com.au if you have any troubles. Choose your language (already set to English) and the country where your products will be shipped. Change this to Australia, then click CONTINUE. 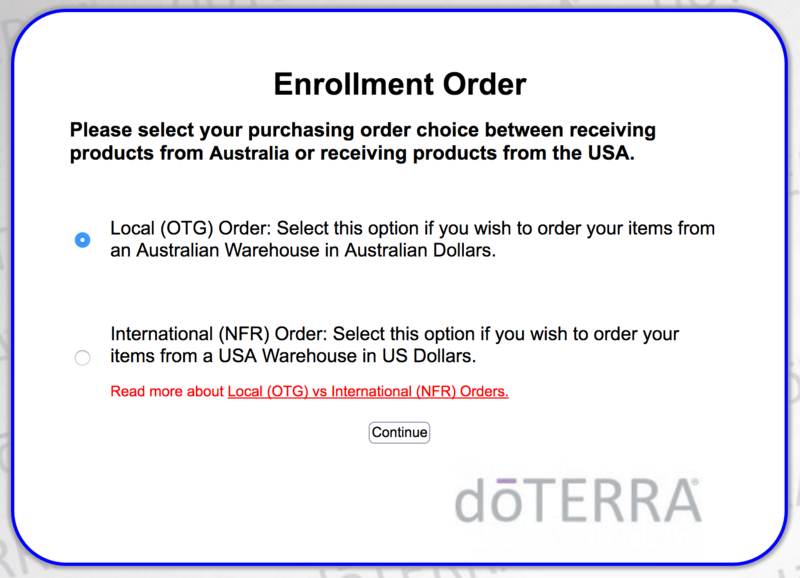 Select Local (OTG) Order (Australian Warehouse, Australian Dollars), then click CONTINUE. ‘Wholesale Customer’ is already checked by default. 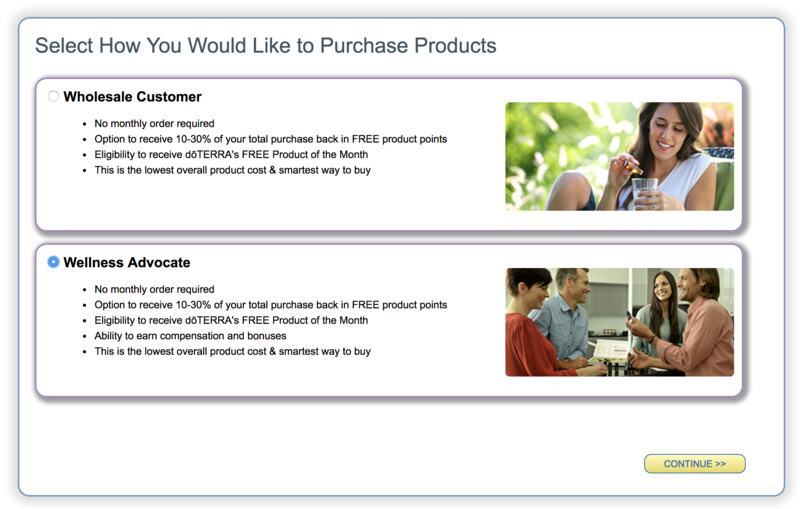 I highly recommend picking the Wellness Advocate option, which is exactly the same, except you, have the ability to earn bonuses and compensation, (being a Wellness Advocate will NOT obligate you in any way to sell or buy.) It’s by far the best value and who doesn’t love a little extra cash! Click CONTINUE. Fill out the top of the application with your personal details and enter your password for your own Virtual Office. This is where you will be able to place future orders, track past orders and more. Click CONTINUE. 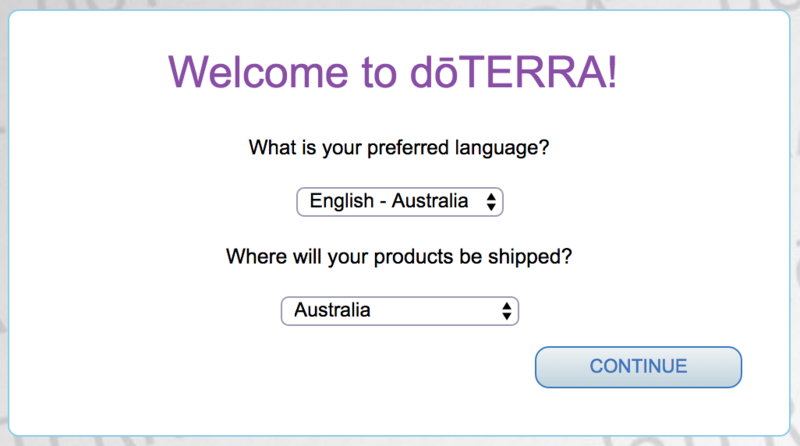 Include your Australian Business Number if you are considering earning money through doTERRA. You can set it up at a later stage if you don’t have one yet. Confirm Kat’s Enroller Id or enter my number: 4301669. This ensures you will get my team support and access to the Facebook groups. If you want to purchase one of the enrolment kits: then you just need to click on the one you’d like. Remember your $35 joining fee is already included in the kit. View the various kits via the button below. If you would like to customise your order: choose the Introductory Enrolment Packet – this is your $35 joining fee and once you’ve added that you now get everything at wholesale price! If you want to add anything else: to you order, start typing the name of the oil in to the space with the placemarker text “Enter additional item # or product name” and then add these to your cart too. View products via the product guide, button below. If you do not already have a bottle of Fractionated Coconut Oil I suggest purchasing a bottle now as it is essential when diluting the oils to apply topically. If you are wanting to start earning commission with doTERRA: add the ‘Local Empower Kit’, which is your complete tool kit to start sharing the oils effectively. 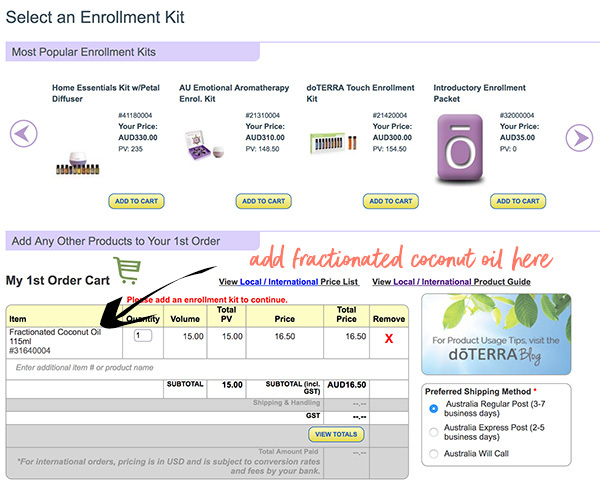 Once you have added your enrolment and any oils you wish to purchase, you will see the items in your shopping cart. Before you can pay for your order, you need to view your totals and show any shipping charges or free products available to you. Click the VIEW TOTALS button. Confirm or alter your billing address if necessary, add your payment details and then click the PROCESS ORDER NOW & CONTINUE button. That’s it! You will see a screen to say your order has been processed. It will then ask you if you’d like to set up your Loyalty Rewards Order. This is doTERRA’s monthly Loyalty Rewards Program (LRP) if you’d like to set up an order for next month, you are welcome to do so now! You can view the benefits of the program here. If you choose to not set it up now, you can always do it later if you decide you want to but this is an optional program and there is no obligation to join. Step 10 – Welcome to The Organised Housewife – Essential Oils Team !! Upon successful submission of your application doTERRA will send you an email with your distributor ID and instructions on how to enter your Virtual Office. You’ll also receive a welcome email from me with links to all the facebook closed groups, some helpful information and you’ll be added to our Essential Oils newsletter to receive ongoing support and education to help you use the oils effectively. doTERRA will send your order to you. I am SO excited to have you join us on this journey and thank you for taking such a proactive step towards managing the health of your family. I’ll look forward to talking with you when your oils arrive to get you started. ~ Kat.